It was June 1944. Russia now turned its attention to another foe and to reclaim territory: Finland. Massing an amazing array of armor and infantry, which totally outnumbered the Finnish, the Russian juggernaut was expected to roll over the Finnish. To the Russian, the outcome expected was to reach Helsinki sometime in July. For the Finnish, it was their last defenses and everything and everyone was expected to sacrifice. Terrain was on the Finnish side-lakes, forests, and few roads channeled any attack. Defensive lines were incomplete and sporadic. Finnish battalions were at 60% strength. Russian units were at 100%. It all looked dire. When the Russians attacked in late June, the rollover began. 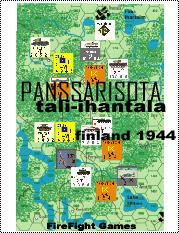 Within days, they were not far from the last Finnish defenses just south of Ihantala and around Tali. The SOS call to the Germans was sounded, the German Airforce and StG 303 arrived by the end of June, in the nick of time. The Finns used their panzerfausts to create small units and combated the many Russian AFVs as they were funneled down roads through forests. Many were lost. The Fins then massed 20 artillery battalions and literally plastered enemy units where spotted. This attack would decimate anything in the artillery zone. Suddenly, when July arrived, the situation was different. Stalin was demanding his men to breakthrough Ihantala or Jusstila. General's asked their subordinates, what is stopping you? 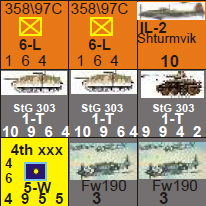 The Russian juggernaut morale had been hit with many small attacks, units were surrounded, apprehension and caution set in. The advance stalled, stopped, restarted, stopped and so on. All this gave the Finns time. The Finnish massive artillery barrages on the Russian spearheads just outside of Ihantala were shattered, regrouping. The Russians tried more attempts to seize Ihantala, each time, massive artillery barrages and air attacks stalled it. What the Russian did not know was just how close they had come to breaking through when the Russians had halted their offensive. The Finns were inches away from a collapse. Their battalions were 25% of their normal strength! A game that is balanced and tense and fun to play for either side!